The original sled dog company operating in Jackson Hole is hosted by Jackson Hole’s eight time Iditarod veteran, Frank Teasley. Frank has been a professional dog musher for 23 years. 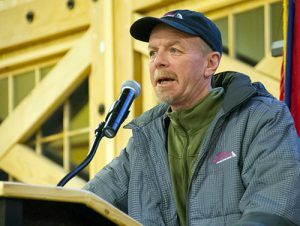 He learned his craft from veteran musher and “Father of the Iditarod,” Joe Reddington, Sr.
Frank’s best Iditarod finish to date was sixth in 1991. He won the coveted Leonhard Seppala Humanitarian Award for the best cared for team in 1989, and the Sterling Silver Award for the most improved team in 1991. Frank co-founded the Jackson Hole Iditarod Sled Dog Tours as a “pension plan” for his experienced racers and a “high school” for his younger, less experienced dogs in training for the Iditarod. Each dog in the kennel receives the care and training of his racing team. Like other successful, modern mushers and sled dog breeders, Frank knows his dogs. Never does he ask more than a dog can give, and never do any of his canine partners fail him. Frank hopes that you will experience the thrills, the joys and the sheer exuberance of this last, great method of winter travel.